UFX remains strong following CHF Crisis. When the Swiss National Bank (SNB) decided to abandon the 1.20 floor for the CHF on Thursday last week, it precipitated an unprecedented crisis across the financial industry, as reported by Bloomberg. UFX traders' accounts were protected from the effects of the decision because of the broker’s commitment to financial security. 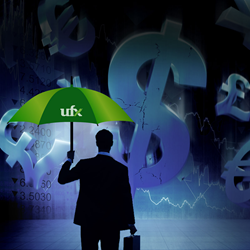 UFX uses automated tools that prevent accounts from reaching negative balances. These tools do not allow its traders to lose more money than they deposited. By keeping traders' money in segregated accounts, all trading accounts are protected. UFX will never use traders' money to cover corporate losses in the case of financial crisis. UFX’s obligation to success through the success of its traders has positioned it as a stable leader in the industry. The broker continues to stand out in the online trading industry by building loyalty and offering security to its community of traders. UFX’s commitment to strict standards of transparency and European regulatory guidelines has proven it to be a safe-haven broker for traders worldwide. Managing Director of UFX, Dennis de Jong stated that: “UFX’s advanced technology has shielded traders from direct exposure to market volatility and helps them negotiate through harsh financial climates. It is this technology that has protected both UFX and its traders throughout the recent industry shift”. In an effort to aid in the industry's recovery, UFX offers one of the most stable and secure trading environments for all existing and future traders. The broker stands as one of the strongest in the industry and gives traders the chance to increase their prospects and secure their financial future. For more information on UFX, click here.